A silver penny of Edward I (1272-1307), Class 10ab dating to 1300-1310. Bury St Edmunds mint. A silver medieval penny of Edward I (1272-1307), class 10ab dating to 1300-1310. London mint. 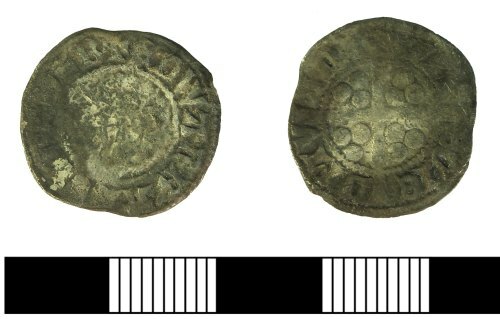 A Medieval silver penny ofEdward I (AD 1272-1307). Long cross Class 9c-10 dating to AD 1300-1310. Bury St. Edmunds mint. Diameter: 18mm.